Continuing one with Cambodia cooking classes a good friend J and I decided a couple of days in Battambang was needed. So early one morning we headed up the river by boat for a full day of cruising. It's a perfectly picturesque way to get to Battambang along the waterways. Battambang is certainly a sleepy little town, especially in low season and I loved wandering around watching the town come to life. One morning I headed off for a morning stroll and some time to ponder and found a great little restaurant serving breakfast. 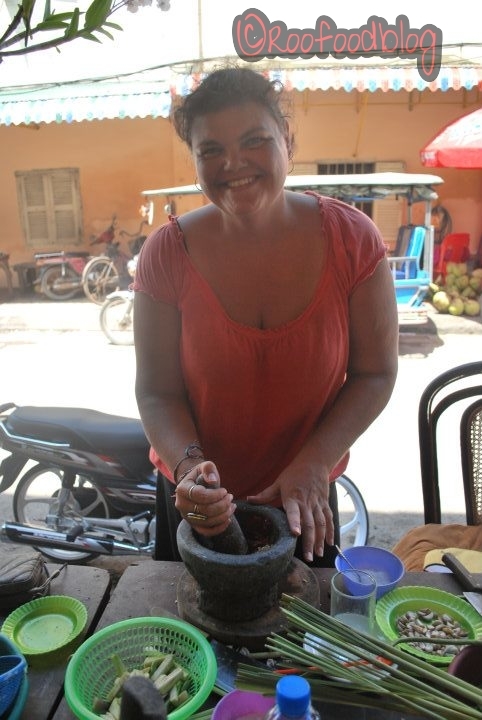 I love nothing more than a traditional Cambodian breakfast of bobor and tea. 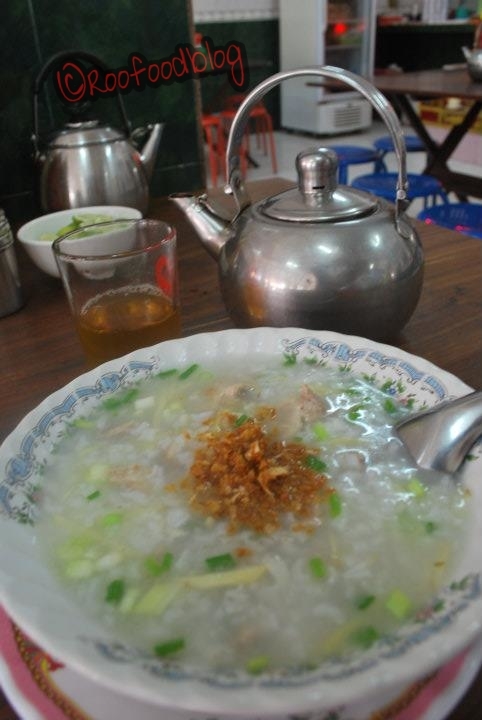 Bobor is rice porridge, also known as congee or juk. Here I had the chicken and ginger. As is most bobor the porridge is cooked down but still leaving some of the rice grains in contact. Giving it a chewy texture as the rice is swollen with stock. The ginger slithers leaving a hint of heat and zing on the taste buds. Later that morning I meet J at the Smokin' Pot as we were doing a cooking class together. 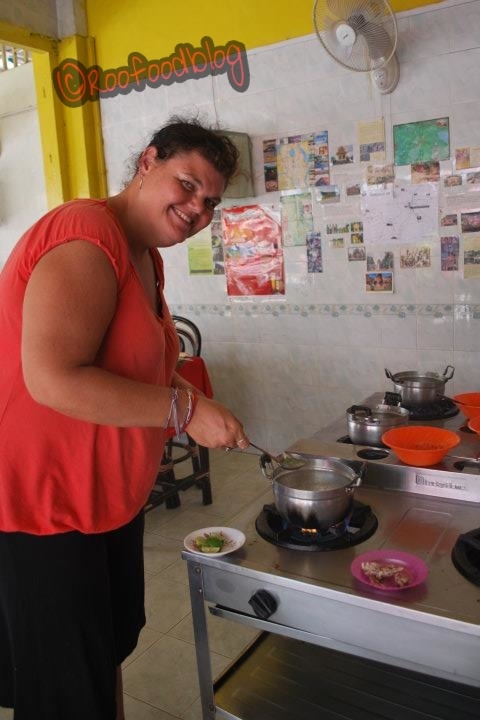 Smokin' Pot is well known cooking class in Cambodia. Chef and Owner, Vannak begins the class with a visit to Psa Nat, the local market for fresh produce and we were purchasing our ingredients for the dishes that we were going to cook. The market was alive with noise, smells, tastes and enough filth to know you are truly in a third world country, yet somehow this appealed to me and just made the experience so much more! This is the type of market that gets my blood pumping and my nostrils twitching. Watching how people conduct there daily routine and people going about their business. I am in my element. 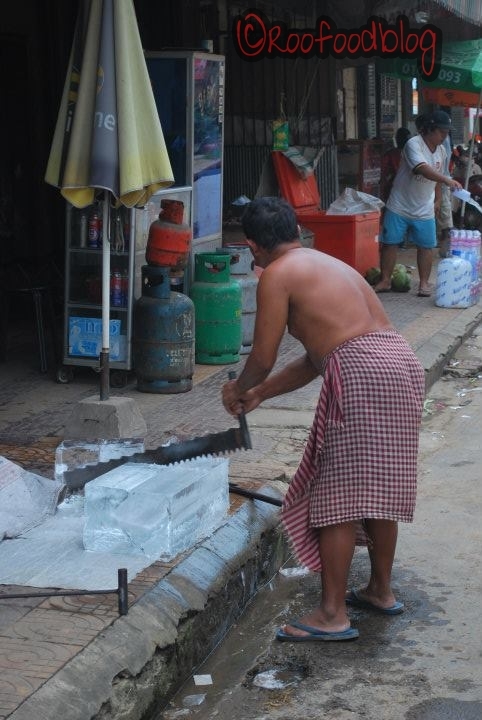 This is reason enough to be careful of having ice in your drinks. Saying that I had ice aplenty and didn't really get sick. 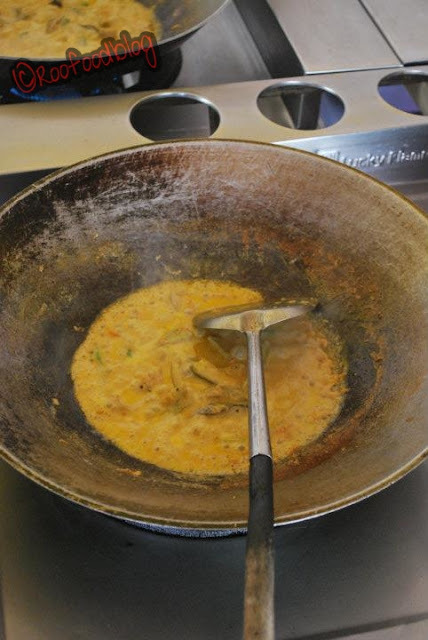 Today we are trying our hands at Fish Amok, grilled beef stirfry and a chicken and lemongrass soup. We all sat around a big table, each armed with a chopping board and a meat cleaver and an array of vegetables and meats. 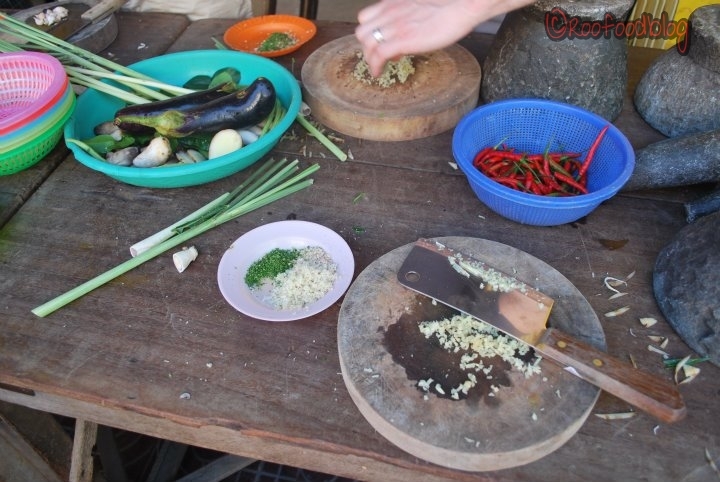 Chopping, dicing and eventually pounding ingredients to make curry pastes in the big mortar and pestles. It is said that if a woman can pound the perfect paste, they will make a great wife.....I must say my skills are finely tuned and can pound out a mean paste, if I do say so myself! After preparing each dish, we cooked them on the portable gas stoves set up for us and all sat down to indulge in each dish as they are hot and fresh. 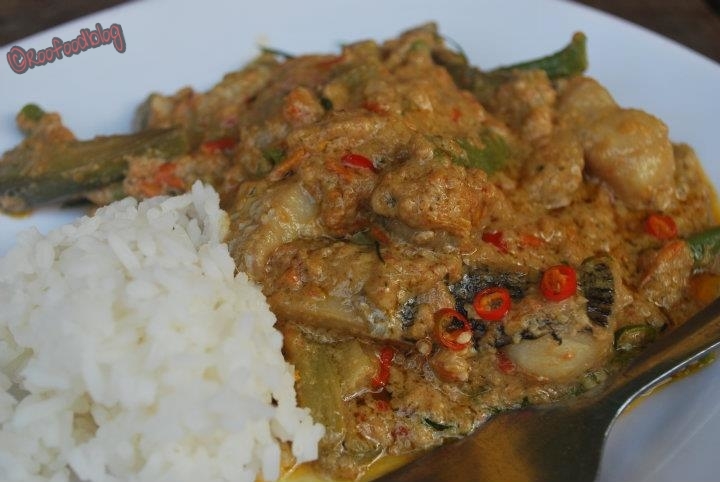 Amok Trey, or Hor Mok (Fish Amok) is probably one of the most well known dishes on the Cambodian menu. It is a dish made with coconut milk, curry and steamed or baked in a banana leaf cup. Here I am preparing the base. 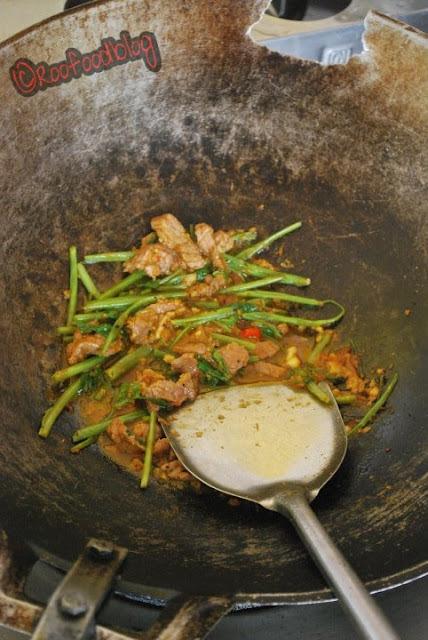 The grilled beef stir fry is a simple dish but so very tasty. Preparing the meat and vegies and a few of those hot chillies! 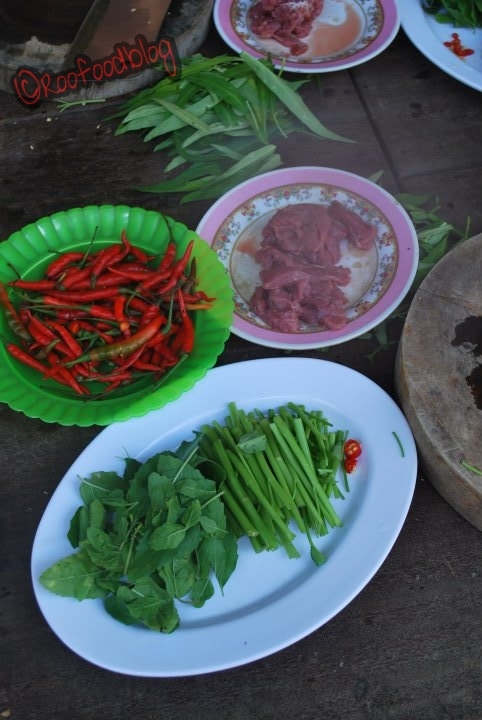 Typically Khmer cuisine is not cooked spicy or hot, and chilli and spicy sauces are added separately to taste. We also had a chicken and lemongrass soup but I have seemed to have misplaced the photo. (If I find it soon I will update this post). 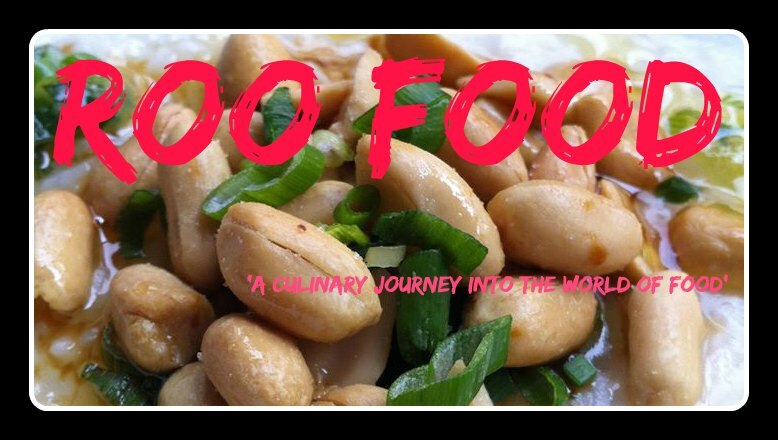 The class is fantastic, fun and informative and you even receive a recipe book not only with what you cooked that day, but their whole repertoire. We are "Chaet Dor Kor", slang meaning "my stomach is stuffed" in Khmer. J and I spent the rest of the afternoon shopping in Psa Nat. My aim was to purchase a Kiwi brand meat cleaver. I was determined to not get "ripped off" even though they are only a few dollars anyway. 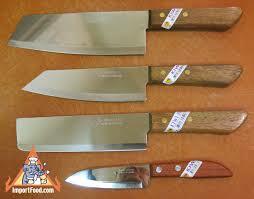 The were recommended to me on my last visit by a friend and wanted to get the meat cleaver. It's still a great knife after all these years. One Khmer lady gave me a price and I asked her to give me a best price (speaking in English obviously). Deciding to give my Khmer language skills a public try, I then proceeded to speak (the limited) Khmer I knew asking for a discount and telling her to not 'overcharge' me (as is expected in the market)....she laughed at me. I think I shocked her more than anything as most Cambodians don't expect you to speak Khmer. I had been previously told that the knife would be $3.50 and no more and that being a traveller would double the price. 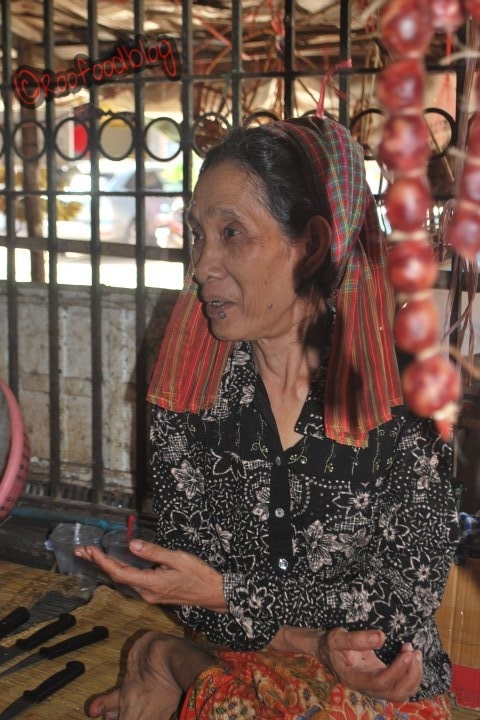 She told me a price in Khmer riel and as I was a bit slow on the translation I replied that I wanted to pay $3.50. We had some good banter and we finally agreed on $3.50 (or so I thought). I passed over my money but she gave me change. I was confused. Turns out that she only charged me $3.25, which was the price she was telling me and I was ironically bartering for a higher price! She said she had such a great laugh at my expense and the fact that I was speaking Khmer that she gave me the cheaper price even though I hadn't realised just for the entertainment! I also got the knife cheaper than what a local would pay! 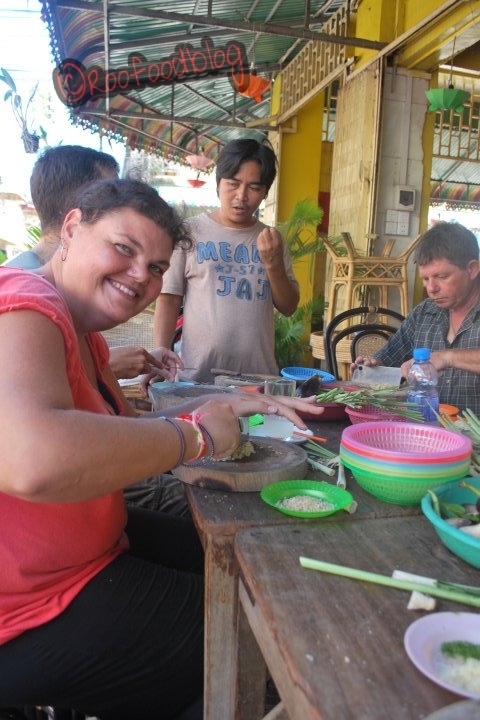 It's these interactions with the locals that made my living in Cambodia all the more wonderful. 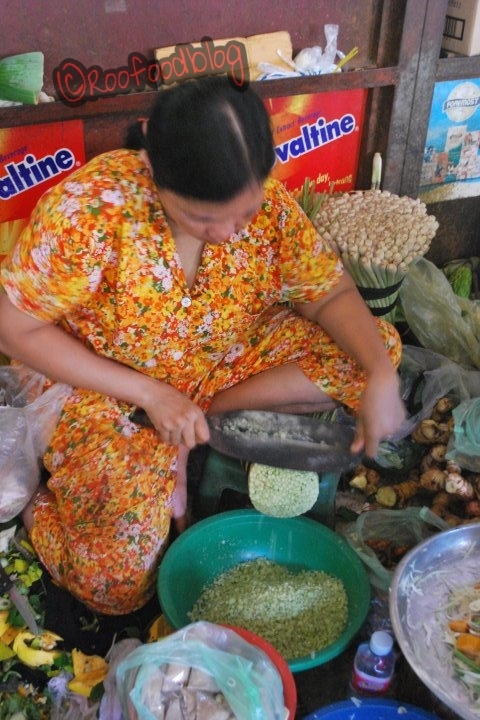 I love Cambodian food, but was not a fan of Battambang. Maybe if I had done a cooking class I would have liked it more. I do like how the Cambodian women wear their PJ's all day. It works.